Electric Avenue is the electrifying art show showcasing the Sheffield-inspired artwork of Matt Cockayne, taking place on bank holiday Sunday 6th of May. Matt is Heist Craft’s resident artist, and at 7 p.m the venue will come to life with the switch-on of a number of handmade glass ‘Neon’ lights. He’s drawn a number of wall murals in the bar and in the brewery since its opening just over a year ago. 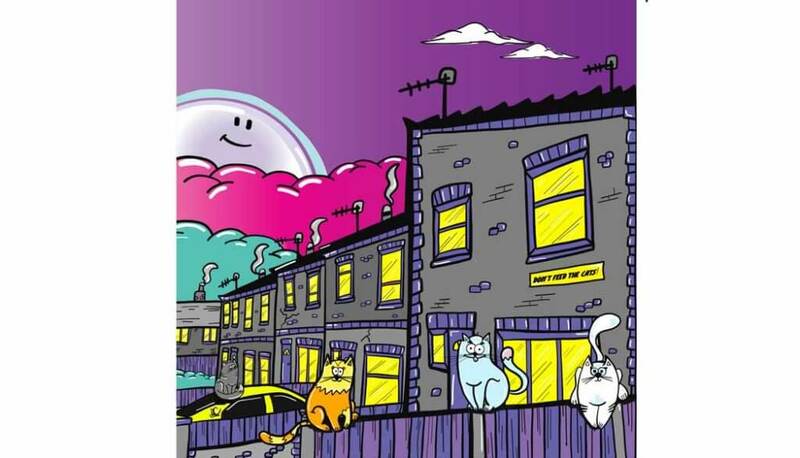 The Sheffield artist chose to use the venue in Clowne, Chesterfield, to showcase his latest artwork because of its atmosphere. The bar is great, but it’s the exposed brick walls that create the perfect backdrop for his new work that’s set in and around Halfway, where he grew up (with the odd local landmark also thrown into the mix). The collection highlights estate life with an added spark of mischief. Matt explained that his wife, Lynsey, “recently talked me into getting a cat, which I have grown to like and is now a big part of our family, so I wanted to include people’s pets into my new art”. 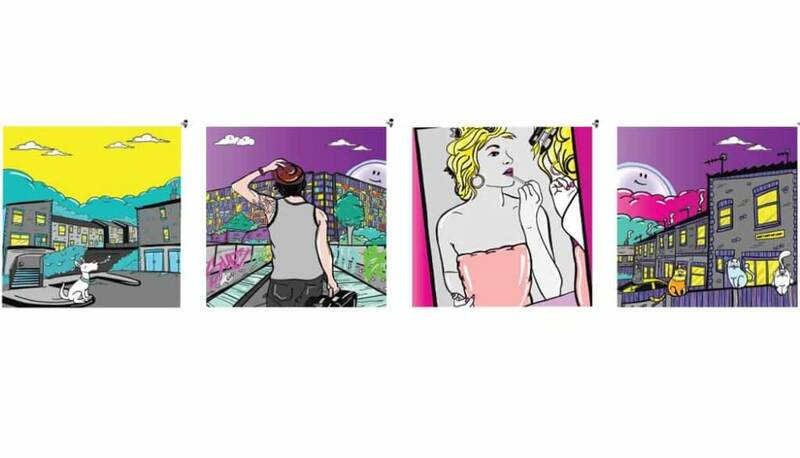 Look carefully and you’ll spot them hidden away in buildings. He’s also included dogs because, “if you’re not a cat person then you’re usually a dog person, and every estate has cats and dogs”. “Growing up in Halfway the estate is split by a football pitch; one side being a private 1960’s built estate, where my parents still live. On the other side, there’s a council estate boasting a fine example of Brutalism architecture, where my grandparents lived. 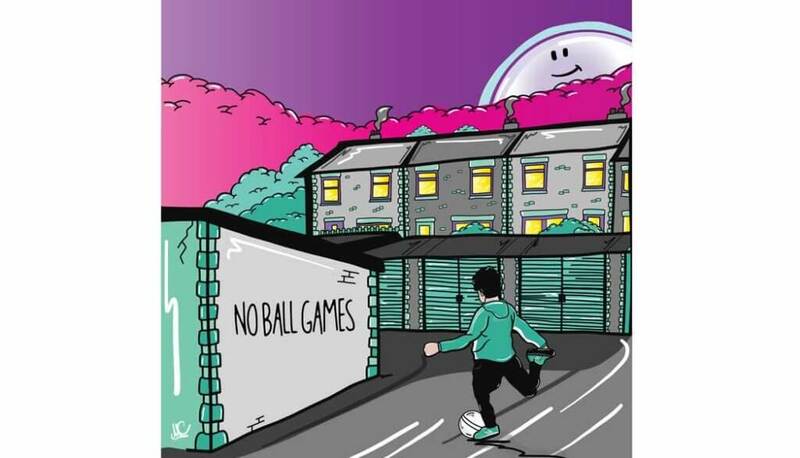 Growing up in the ‘90’s, I was always whizzing around the estate with my mates on my BMX and have fond memories of playing football in areas you’re not allowed to – defying the ‘no ball games’ signs”. I love the sharp angles of the concrete buildings which are dotted up and down the UK. It’s not everyone’s cup of tea but I wanted to bring these streets to life with colour, and show their inner beauty”. Heist has always been a big supporter of Goo Design, and they’ve worked together on a number of projects. Matt has developed a close relationship with owners Adam France and Dan Hunt, who plan to open their own brewery house in the future. As well as art, there will be a Goo pop-up shop, live music, food vendors outside in the beer garden and a limited edition Raspberry Berliner Weiss (a pink beer). Let’s hope the sun makes reappearance… not that that’ll stop us. Though the launch is in the evening, you can have a sup on Heist’s fine beer all day. There’ll also be a ‘FREE’ mini artwork given to people with every pint of beer bought, collaborating with Sheffield’s Lost Industry Brewery. "The levels of positive energy that Wahala Wahala produces is truly on an infectious scale... "
The long-awaited debut album from Afro-fusion band K.O.G. & the Zongo Brigade sounds as massive as you’d expect from the..